At Wellington BBQs and Fire we supply the best range of gas and wood fireplaces in the region. However, the service doesn’t stop there. Wellington BBQs and Fire can assist you with all aspects of creating the fireplace of your dreams. We offer a free in-home visit and quote to any household in the Greater Wellington Region which includes the Hutt Valley and Porirua; we can also provide this service to regions outside of this area for additional costs. Wellington BBQs and Fire then arrange permits, installation, building and plastering which is all done through our installation specialists We ensure you will be provided with the very best service in town. We understand there are a number of issues to consider when it comes to buying a fireplace, we can guide you on choosing the best option from a heat source and a decorative standpoint. Our team is only too happy to share our knowledge with you and come up with a design and fire that will best suit you and your home. A fixed quote is provided so there will be no unexpected costs along the way. Have a look at our current range of fireplaces or come in and see us today. Whether you’re looking to install a new fire or replace an existing fireplace. You will need a building consent. Wellington BBQs and Fire can arrange this for you as well as all your installation, building and plastering needs. This is all done through our installation specialists . To read more on the fireplace installation process. Click Here. There are two types of fireplaces; freestanding and inbuilt. Freestanding fireplaces stand away from the wall and can be positioned anywhere there is enough free space. The noticeable difference compared to an inbuilt fireplace, is the flue pipe is visible (the flue pipe is the channel that the smoke travels through). Inbuilt fireplaces are partly enclosed within a building structure and you cannot see the flue pipe. The inbuilt design has the value of taking up no floor space, making them perfect for small living spaces. Their sleek look and design also provides a modern look and feel to any room. Often we install these into existing open masonry fireplaces. Push a button, and hello fire. It’s that easy. There are three different types of gas fireplaces, direct vented (through the wall or roof), top vented (which needs a chimney or vent) and ventless. Gas fires can run from a gas main or an LPG bottle. Modern gas fireplaces are extremely efficient with a choice of standard or flame effect models. 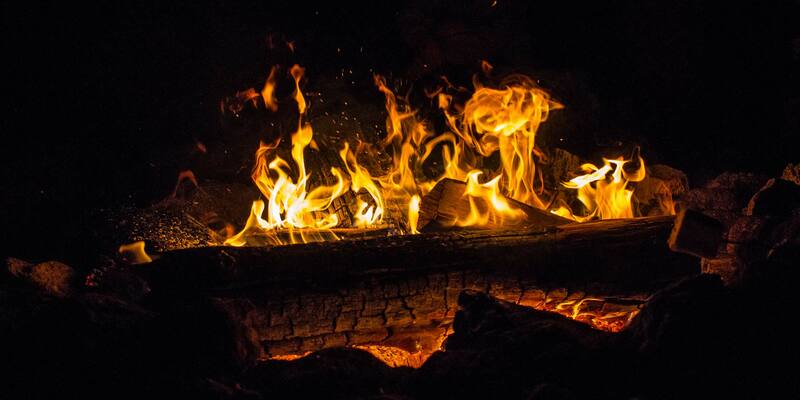 There’s nothing quite like the sound of a crackling wood fire. You just need to store some dry firewood, build the fire, and keeping it going. . We have a great supplier of kiln dried firewood, conveniently available all year round so you don’t need to stockpile huge amounts. Wood burning fireplaces require maintenance. The chimney needs sweeping and cleaning to remove soot. The wood burner not only heats your house, some wood burning fireplaces come with a water booster option for heating your water, and some also have cooktops. So you can enjoy nice dry heat and a great warm atmosphere while saving on electricity or gas for heating water and cooking. Clean Air fireplaces are the most common fireplaces, especially in urban areas. The National Environmental Standards (NES) for air quality requires that all wood burners installed on properties less than 2 hectares must have a discharge of less than 1.5 grams of particles for each kilogram of dry wood burnt, and a thermal efficiency of at least 65 per cent. Areas that are over 2 hectares may install rural fireplaces on their land. The NES doesn’t consider multi-fuel fireplaces as wood burners which means they are exempt and can be installed on properties under 2 hectares. Multi-fuel fireplaces give you the flexibility of using two different types of fuel, typically coal and wood. They usually have longer burn times and are silent running however they’re not as clean burning and their unit costs are higher. For more information on what you need to know before you buy a fireplace click here. Are you looking for a new fireplace or are you looking to replace your existing unit? Whether you’re looking to install a new fire or replace an existing fireplace. You will need a building consent. Wellington BBQs and Fire can arrange this for you as well as all your installation, building and plastering needs.